Our ETHOS philosophy is that whether a guest wants to walk 1 or 100 miles, we have an option for them. ETHOS guides will personalise each experience to their your abilities and desires by offering support and flexibility. Please note that the information below is therefore meant as a guide. Discover the heart and soul of North West Vietnam in one of the most ethnically diverse parts of the world. 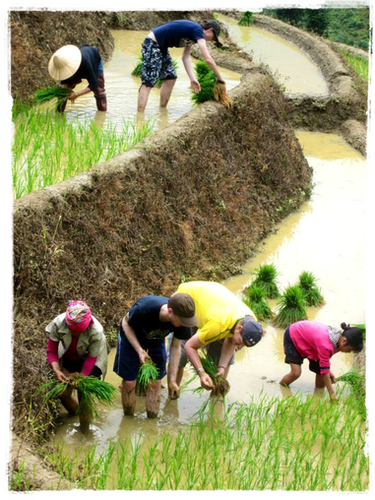 Encounter history, both ancient and modern, and witness the unbelievable splendour of the famed rice terraces. Our team of advisers are made up of British and Vietnamese nationals with over 35 years of combined experience of sustainable tourism in Sapa. We would be delighted to assist you with planning your itinerary whilst in the area and look forward to introducing you to our excellent group of English-speaking Hmong and Red Dao minority guides who have a great deal of local knowledge. 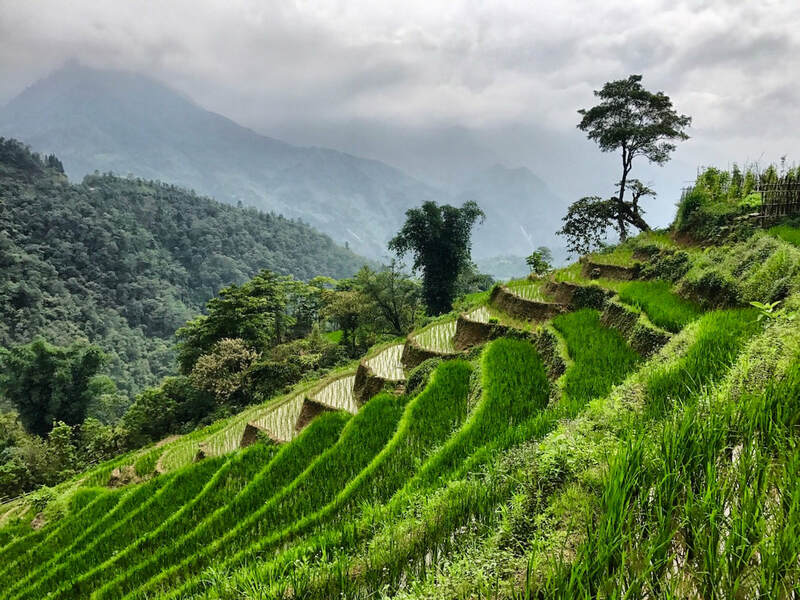 They take pride in sharing their beautiful landscape with visitors and are ready to lead you through the incredible mountains of northern Vietnam and inform you about the traditions an culture of the hilltribe communities in Sapa District. No art has a more immediate connection than that of photography. The landscapes and people of northern Vietnam are amongst the most photogenic of anywhere in South East Asia, so why not join us exploring the Sapa area and capture some shots that you can treasure forever. The real Vietnam is a hidden secret waiting to be discovered. To find it you need to be intrepid and have a strong desire to explore. No doubt that the best way to see Vietnam is off the beaten track and by motorbike. Sometimes it’s great just to sit back and enjoy the amazing views and that is where Sapa Mountain Riders is here to help. We drive, you ride and North West Vietnam comes alive. Inspire Your Child to Learn About the World. 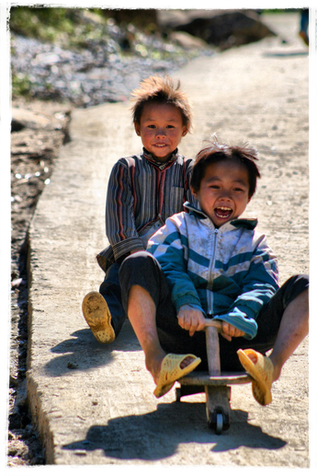 Little Sapa is your child's ticket to an exciting mountain adventure. Inspire a love and understanding of the world as your kids learn about the way the ethnic minority kids live, play and survive in the mountains of Northern Vietnam. Vietnam offers a world of amazing culture and textile traditions ranging from villages still weaving and dyeing textiles using traditional methods to colourful ethnic minority groups creating unique beautiful textiles, embellished in rich embroideries and batik. If you are interested in textiles and creative design, look no further than the Rad Dao of Ta Phin. The women wear some of the most colourful and diverse costumes of all ethnic groups but can be identified by their black trousers richly embroidered with flower or small star patterns. Our classes investigate everything from materials to symbology. The ethnic diversity of Sapa is incredible. If cycling is your things, let us develop a route that suits your needs and includes the highlights that the area has to offer. We have downhill only rides for beginners and longer trails over a range of terrains for the more experienced rider. Muong Hum is small, yet active hill tribe market, that typically attracts five ethnic groups. Taking place each Sunday morning, visitors can expect to see Hmong, Dao, Ha Nhi and Giay people trading their local wares in a very traditional and intimate village setting. Ham Rong (Dragon's Jaw) Mountain towers above Sapa. Shaped like a dragon’s head in the clouds, Ham Rong Mountain is approximately 2000m tall with trees and colourful flowers almost all year round. The path leading to the summit consists of many stone steps and crosses small streams that lazily run through beautiful foliage. About mid­way, travellers will find themselves in an orchid -garden with over 400 species of colourful blooms. Standing on the highest point of Ham Rong Mountain, visitors will have breathtaking views over Sapa town. Start the day driving over one of the most stunning mountain passes in all of Vietnam. Visit unspoilt villages and spend time with some of the least visited ethnic minority groups in all of Vietnam. Ta Phin is a picturesque village North of Sapa. Set within a valley with a towering mountain peak at one end, this village is alive with the daily life of the Kinh, Red Dao and Black Hmong people. What better way to really explore the unknown than venturing into the dense cloud forests that flank Mt Fansipan. From the unique black bamboo groves to the rare and incredibly valuable Pomu tree, the forest around Sapa are full of wonderful plants and animals that you might glimpse if you're quiet and patient enough. Walk through the village of Sa Pa and it will certainly feel like you have stepped back in time. The entire village sits under an enormous tree that is said to be the home of the spirit gods. The Hmong Batik Class is an introduction to Hmong culture. Each student will create a wax resist, Hmong style design on hand loomed hemp. When was the last time you did something for the first time? ETHOS believe that travelling is learning. What better way to learn about a culture than to be part of it. With a complex geopolitical history, the people of the northern Vietnamese highlands have shown great resilience and creativity to overcome hardship. This is evident in day to day life and reflected in the food which is both exotic and highly varied. Out street food tour takes in some of the more unusual Sapa foods, many of which are foraged from the forest or collected in and around the rice paddies. Vietnam is a multi-ethnic country with over fifty distinct groups (54 are recognised by the Vietnamese government), each with its own language, lifestyle, and cultural heritage. Because of its wide variety of peoples, religions, and languages, especially for its size, Vietnam is a wonderful place to explore. Whatever your biking experience, North Vietnam has something for you. We offer riding experiences that integrate trekking, homestays, mountains, forests and rice terraces. The Lao Lu people of Lai Chau are amongst the mote private and traditional of all ethnic minority groups. This is experiential travel for those interested cultural costume and fashionable adventures. ETHOS work in association with a number of host families throughout the Hoang Lien Son Mountain range and each village has something different to offer. Our homestay partnerships grew out of ETHOS’s mission to promote and support responsible travel. From the popular Lao Chai and Ta Van homestays to the quiet and remote village of Lao Chai San, each homestay has a different feel, but all offer the traveller a rare glimpse into the way of life that has all but vanished from the rest of Asia. Here you will find no welcome mats or rehearsed “cultural” parades, just real people living real lives who greet visitors with genuine warmth and real smiles. Nestled in the northern hills of Vietnam exists one of the most bustling ethnic markets in all of Southeast Asia! On Sundays, the ethnic minorities from the surrounding villages and hills come by foot, motorsbike, by horse, and by buffalo for their chance to socialize, eat, drink, trade and get a haircut. It is a blur of colourful plaids and stripes. Bac Ha market is about 3 hours from Sapa. We have a range of trekking tours available for you to choose from that have been specifically designed to enable you to experience some of the very best landscape and scenery Sapa has to offer. Ascending to the summit of mount Fansipan is one such challenge and can take between one and three days depending on your choice of ascent routes. This experience is ideal looking for an extreme challenge. Ta Giang Phin is a 36km drive from Sapa and passes through some incredible landscape. On route you will see a stunning waterfall, and pass by some of the most ancient and magnificent forests in all of Vietnam. Tam Đường is a rural district of Lai Châu Province in the Northwest region of Vietnam. The journey from Sapa is approximately 70km on one of the greatest driving roads in all of Vietnam. On a clear day, the views of Mount Fansipan are simply incredible. On arrival in Sapa, we can highly recommend getting a taster of what the area has to offer. We offer a special half day walking option that covers a distance of approximately 4.5km to 5.5km.